True fear comes from within. Universal Orlando’s Halloween Horror Nights brings together stories and visions from the world’s most notorious creators of horror and takes them to the next level. This year, time twists and turns on itself—ripping cinematic greats, cult classics and even original nightmares from decades past into a new era of fear with more terrifying houses than ever, sinister scare zones and outrageous entertainment. As the sun sets on days filled with thrills in all of Universal Orlando Resort’s theme parks, the night awakens with a frightening chill at Universal Studios Florida™. Surrounded in shadow by screams and mad laughter, you’re never quite sure if your spine is tingling with dread or sheer excitement. Step by step, you enter into terrifying houses, inspired by the biggest names in horror. Face nightmarish creatures on streets twisted into sinister scare zones. Escape to some of Universal Studios’ most exhilarating attractions where heart pounding takes on a different meaning. Lose yourself in outrageous entertainment filled with diabolically entertaining surprises. Then with each desperate breath, you realize you cannot run from the fear within. 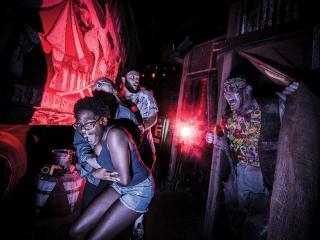 HALLOWEEN HORROR NIGHTS at Universal Orlando Resort is a separately ticketed event held at Universal Studios Florida™. Event begins at 6.30pm and closing times may vary. All ticket usage must be completed on or before November 1, 2019 when the ticket will expire in full. Unused nights will be forfeited. Tickets are non-transferable. Event occurs rain or shine. No rain checks, returns or refunds. Dates, times, attractions and entertainment are subject to availability and may change without notice. Free self-parking after 6pm is not valid for Halloween Horror Nights event nights. Other restrictions may apply. Universal elements and all related indicia TM & © 2019 Universal Studios. All rights reserved.